B.F. Rich Cabernet windows are entirely fusion-welded. The sashes and frames use this advanced manufacturing method. Unlike windows that are mechanically fastened with screws and sealant to hold their window sash and frame together, we fusion-weld vinyl sections together. Fusion-welds won’t come loose or weaken over the years. Additionally, the state-of-the-art shadow-miter process ensures frame and sash corners don’t have the excess weld flash found with other fusion-welding techniques. In short, B.F. Rich Cabernet windows are designed and manufactured to be the strongest and most attractive you can find. 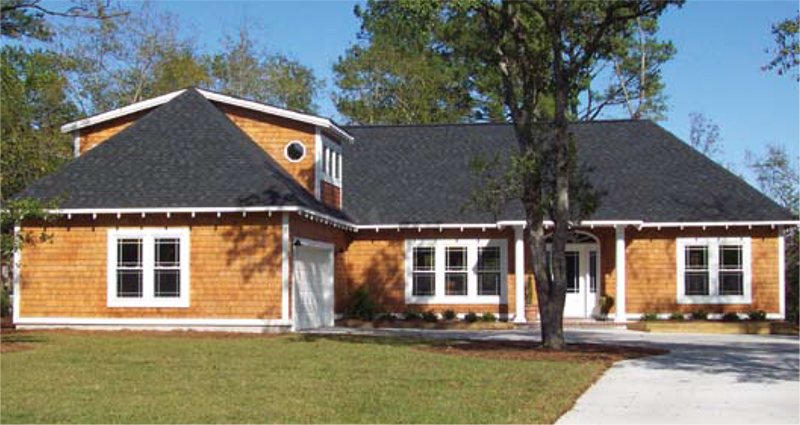 Multi-Chambered Profiles reduce heating and cooling costs year round. Fusion-welded sashes and frames for superior strength. Stainless-Steel constant force balances for smooth, quiet operation. Deluxe vent latches provide positive stops for ventilation. Double deluxe cam action locks reduce air infiltration and increase security. An interlocking meeting rail enhances security against intruders, adds stability to the frame and greatly reduces air infiltration. Triple fin-seal for maximum air infiltration protection. Recessed sash tilt-retainers lock sash securely in jamb. Deluxe weather-stripping on sashes and frames with long-life polypropylene fin barriers surrounded by polypropylene pile for superb resistance to air, water, dust and noise. Gray/Gray dual durometer and warm-edge glazing spacer. Full integral lift rails on both sashes provide easy operation when opening or closing windows. Solid vinyl lineals with color throughout. Beveled interior sash rails for a more elegant appearance. Green Shield Series) to achieve maximum performances. 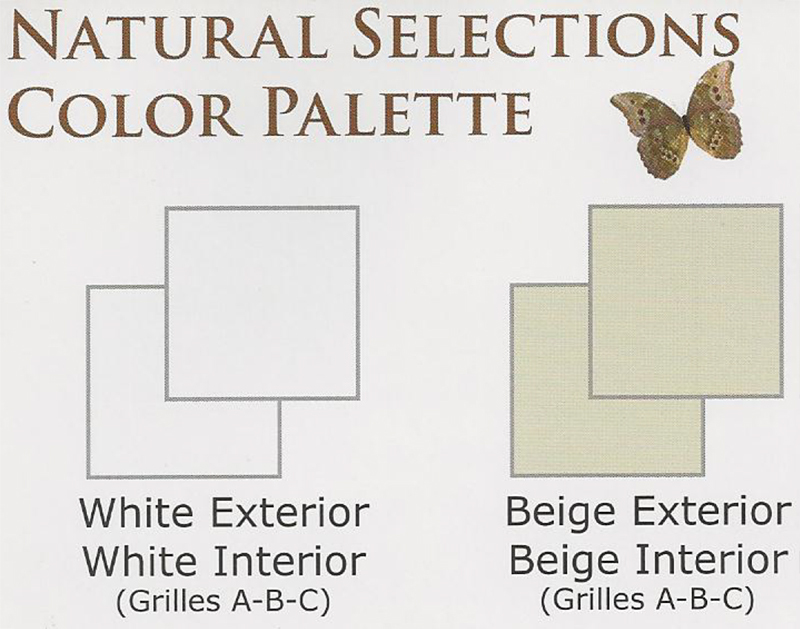 Grilles are available in dimensional contour or standard flat design. You can design your window to have Grilles Between the Glass (GBG) for ease of cleaning and a smooth clear look. Alternatively, you may design your windows with Simulated True Divided Lites (STDL), which have internal and external components to give the dimensional depth look of divided lite glass. B.F. Rich is able to design many custom grille styles. B.F. Rich Vintage all-vinyl window systems deliver a unique combination of high-performance and exceptional value. Vintage provides outstanding energy efficiency while it keeps your home warm in winter and cool in summer. Whether you’re building a new home, remodeling or adding a new living space, you’ll appreciate the beauty, comfort and ease of operation that’s built into every fusion-welded Vintage window. All-vinyl, fusion-welded, maintenance free construction that will never crack, rot, or peel, will never need painting and is easy to clean. 7/8-inch patented DuraSeal™ insulating glass provides excellent insulation to save you precious heating and cooling dollars. Tilt-in cleaning of both the upper and lower sash from the comfort and safety of the inside of your home. Double locks and double night latches for security and safety. Double-hungs come with a half screen, a full screen is optional. Replacement Series uses a Stainless Steel coil-spring constant force balance system ensures fingertip operation and superior performance in harsh environments. New Construction Series utilizes an inverted block and tackle balance. Both sashes are operable in a two lite slider. All-vinyl maintenance free construction that will never crack, rot, or peel, will never need painting and is easy to clean. 7/8-inch patented DuraSeal™ insulated glass provides excellent insulation to save you precious heating and cooling dollars. Lift-out sash for cleaning from the comfort and safety of the inside of your home. Double sash locks for security and safety. Brass wheels on operable sash ensures fingertip operation. Sliders come with a half screen, full screen is optional. Both end sashes are operable in a three lite slider. Grilles are available in standard flat design, dimensional contour or V-Groove cut glass. Grilles are between the glass (GBG) for ease of cleaning and a smooth clear look. V-Groove grids and patterns are orientated on the interior glass surface. The Chateau window from B.F. Rich is available in double-hungs, two and three lite sliders, picture windows, and architectural shapes. It is designed to provide the features and benefits of a premium vinyl window at a modest price point. 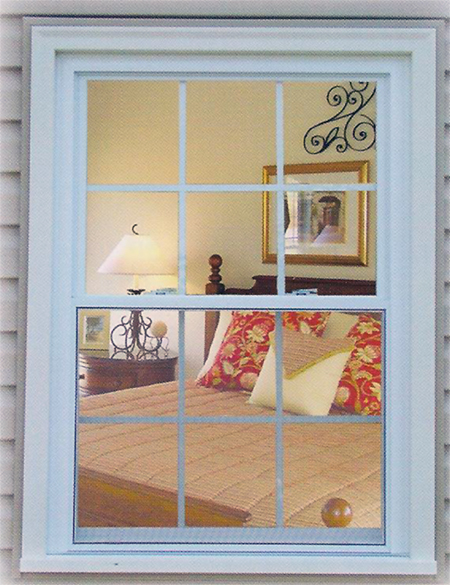 The Chateau window line has a fusion-welded master frame and beveled sash design. 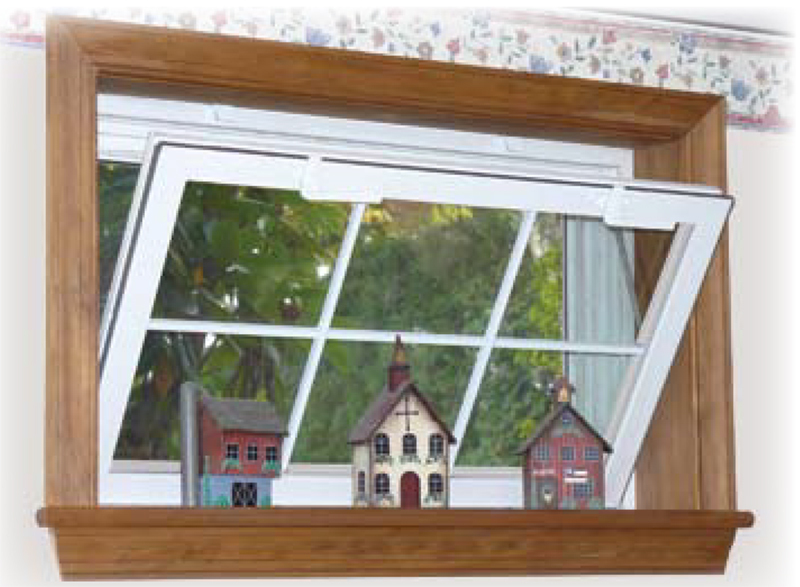 Chateau double-hung sashes tilt-in to allow safe, easy cleaning from the inside of the home. Half screens are standard and an optional full screen allows ventilation at both operating sashes. Chateau’s two or three lite, horizontal sliding design allows either the left or right sash operation. Chateau sliders are easy-to-operate and sashes lift out from inside the home to allow safe, easy cleaning. An optional full screen allows ventilation at both operating sashes. When it comes to investing in your home, nothing enhances its beauty, value and comfort like B.F. Rich custom-designed HORIZON windows. horizonYour B.F. Rich authorized dealer will assist you in designing the HORIZON windows that best fit your home’s particular style and specifications. Every sash and frame is constructed of fusion-welded extrusions for strength, durability and horizonresistance to air and water infiltration. B.F. Rich’s HORIZON window systems are constructed of Lead-Free PVC and will not crack, peel, warp or blister, That’s the B.F. Rich guarantee. Horizon 2 Lite Slider WindowEvery one of our HORIZON windows is custom computer-designed to your home’s exact specifications. 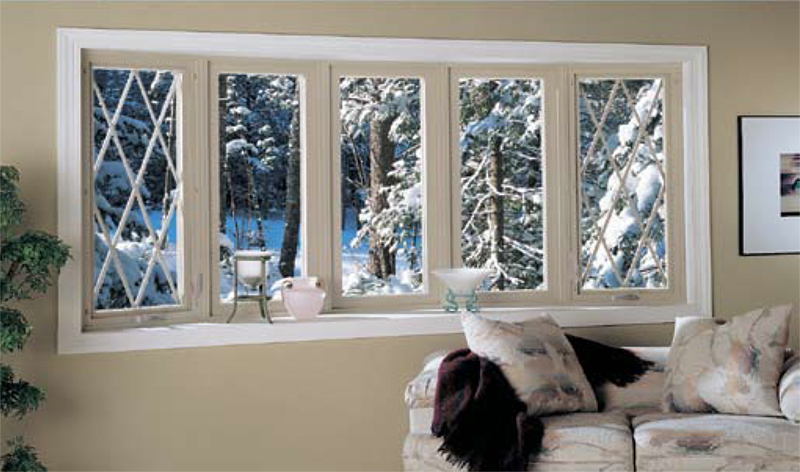 The HORIZON window is available in your choice of double-hung, slider and stationary picture windows. HORIZON’S low-profile, horizontal sliding design provides maximum glass to vinyl ratio, offering the largest viewing area. An optional full screen allows ventilation on both operating sash. 3/4-inch patented DuraSeal™ insulating glass provides excellent insulation to save you precious heating and cooling dollars. Tilt-in cleaning of double-hung windows from the comfort and safety of the inside of your home. Lift-out cleaning of 2 and 3 lite slider windows from the comfort and safety of the inside of your home. Double locks and double night latches for security and safety with the windows open or closed. Stainless Steel coil-spring constant force balance system ensures fingertip operation and superior performance in harsh environments. Double-hung and sliders come with a half screen, a full screen is optional. 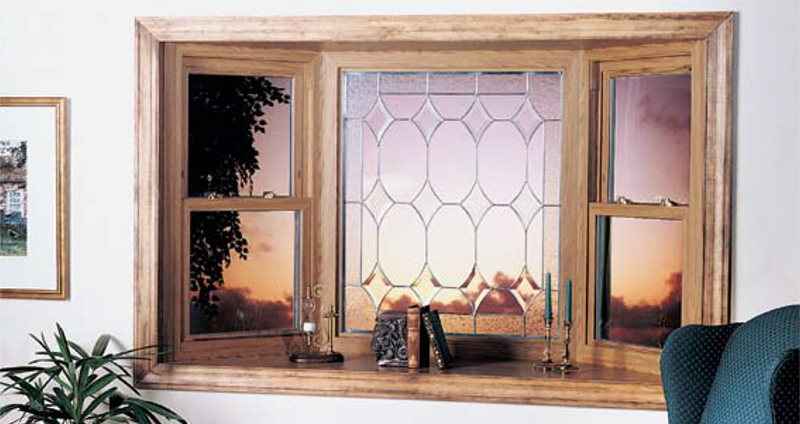 Woodbridge offers the look of a traditional wood window with the durability and low maintenance of vinyl. Designed with unique features for new construction the Woodbridge window has many enhancements including Vinyl Siding J-Channel, Simulated True Divided Lites, sill nosing option and eastern casing with sill nosing. Outstanding looks, enhanced energy efficiency and superior lifetime performance with our premium 4 1/8” multi-chambered vinyl master frame and computer fusion-welding technology. Inverted block & tackle balance is designed to provide easy operation and has no grease or oils to attract drywall dust during construction. Maximized insulated glass with double-pane 7/8” insulating glass with drop-in glazing and “warm edge” Dura-Seal™ spacer. Maximize energy efficiency and significantly reduce condensation with optional Low-E glass and argon gas insulation. Superior safety and convenience with standard double locks at 20” and double vent latches. Integral J-Channel is built in to the brick mold exterior frame. Pre-punched nailing fin extruded as an integral part of the frame. Safe and simple cleaning from the home’s interior – both upper and lower double-hung sash tilt-in for the easiest cleaning. Slider sash lift-out for cleaning. For ease of installation and energy efficiency – WOODBRIDGE windows are available in standard sizes or custom-manufactured sizes to accommodate rough opening sizes. Full screen is standard, optional half screen is available. Wood Jamb Extensions primed or stain grade available at 4 9/16”, 6 9/16” or custom jamb size. 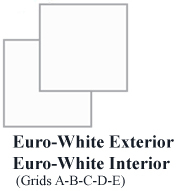 Upgrade windows with a wide variety of decorative internal grid options or choose Simulated True Divided Lites to capture the appearance of a traditional wood window. Eastern Casing & Sill Nose Eliminates the need to apply a casing to a window in the field after it has been installed. Vinyl flat casing replicates the appearance of a flat exterior 3 1/4” wood casing and has a built-in J-Channel and nail fin. Double-hung and sliders come with a full screen. B.F. Rich Casement windows feature equal-lite frames so they align beautifully with stationary or architectural shape frames. Concealed hinges create a sleek appearance, inside and out. Innovative and patented Truth E-Guard® Casement hardware technology offers a 90° opening for optimum ventilation and the ability to clean the window from the inside of your home. Our Casement multi-point locking system allows for easy operation but also provides security and a tight seal. Our Casement Series is available with Low “E” and Argon filled energy efficient glass and carries the ENERGY STAR™ label.Casement windows are offered in a wide variety of styles to please your contemporary tastes. Other styles include Awning Series, Bow, Bay and Garden Windows, Architectural Shapes and multi-lite Casements or Awnings with multiple ventilation options. Awning windows can be used alone or positioned above or below a window or door to add ventilation and light to a room. When placed in rows or even against other windows, they can create a “wall of light” effect that adds beauty and functionality to a room. Awning windows have the same frame and sash as a casement window except they are usually wider than they are tall and are hinged on the top and crank open from the bottom towards the outside of the house. 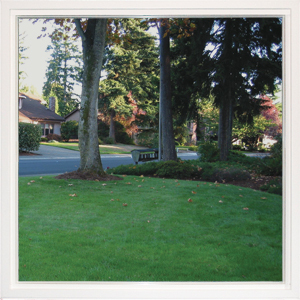 Heavy duty, multi-chambered vinyl frames provide extra strength and insulation. Interior full screens included. See screen styles. Patented DuraSeal™ insulating glass provides excellent insulation to save you precious heating and cooling dollars. 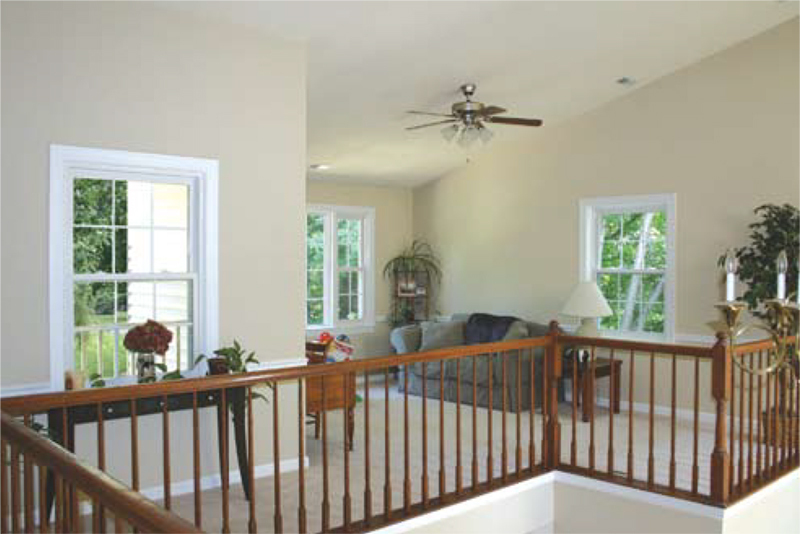 Casement windows crank open a full 90 degrees for easy cleaning from the interior of your home. The stylish nesting cover and full-flip handle provide an attractive design. Conveniently located within reach, the floding crank has smooth, reliable operation. The nesting hardware also minimizes the interference with window treatments such as curtains or blinds. You can design your window with Spiller Series Art Glass, Pattern V-Groove or Grilles Between the Glass (GBG) for ease of cleaning and a smooth clear look. Alternatively, you may design your bay or bow window with Simulated True Divided Lites (STDL) which have internal and external components to give the dimensional depth look of divided lite glass. 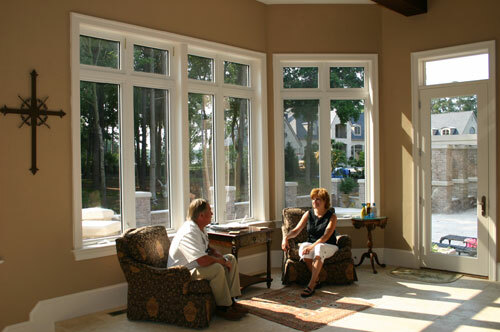 Additional space, more light, ventilation, and a larger viewing area are just a few of the many benefits that B.F. Rich bow and bay window systems offer. The graceful curve of a bow window is a perfect way to open any room. Bow windows are available in 3, 4, 5, 6 and 7 sections. They are custom made to order to ensure an exact fit. They are made at a standard projection angle of 10°, but can also be ordered at a custom angle to fit your projection requirements. Widen your view of the world and bring the outside in. Bay windows add dramatic architectural interest to the exterior of your home, while expanding interior space and light. 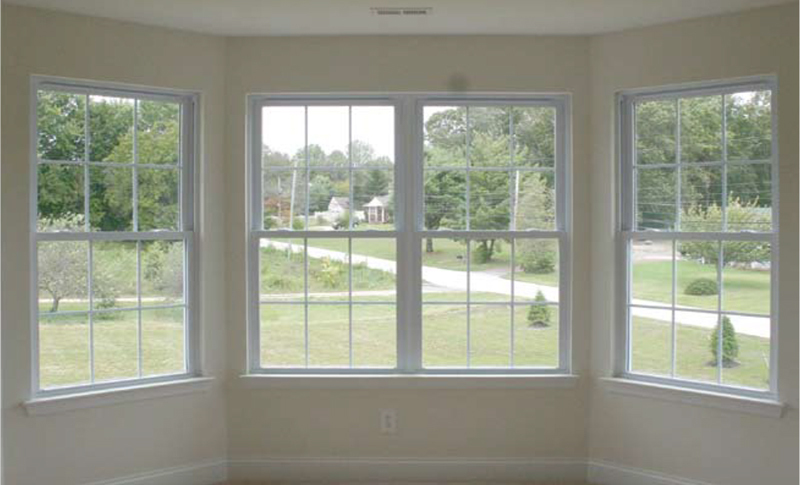 B.F. Rich bay windows typically consist of three windows joined together. The center window is usually stationary while the two side windows are usually operating windows consisting of casements or double-hung windows. The standard configuration is 25%-50%-25% but B.F. Rich specializes in making custom bay windows to meet your design requirements. B.F. Rich bay windows are available in 7°, 10°, 15°, 30°, or 45° angles. 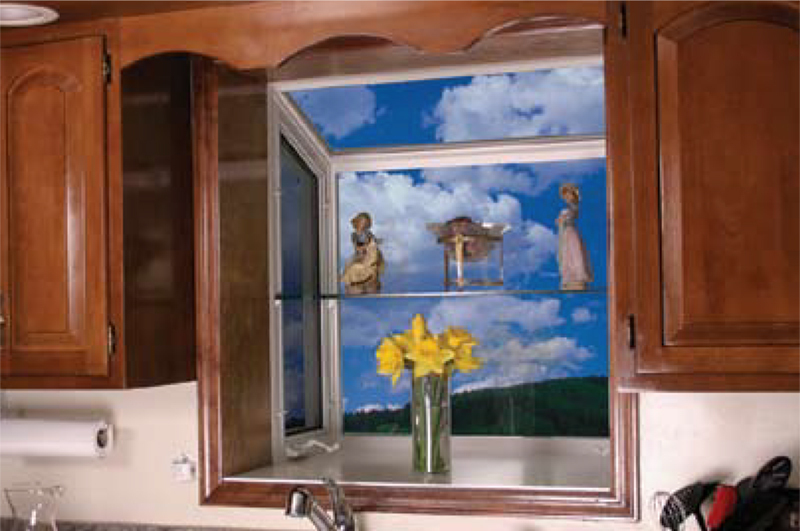 When B.F. Rich decided to produce a vinyl Garden Window, we went to the source – you the homeowner – to find out what would best meet today’s needs. After listening carefully, we designed our garden window from the inside out with the features you found most important. We built in standard features such as; no boxed-in look from the interior, Truth™ corrosion resistant self-locking hardware, easy access to window handles and smooth – convenient operation. We also maximized the window’s glass area creating an incredible view of the outside landscape while allowing in daylight. B.F. Rich’s unique cantilever seat board design and fusion-welded components provide superior strength to the unit. 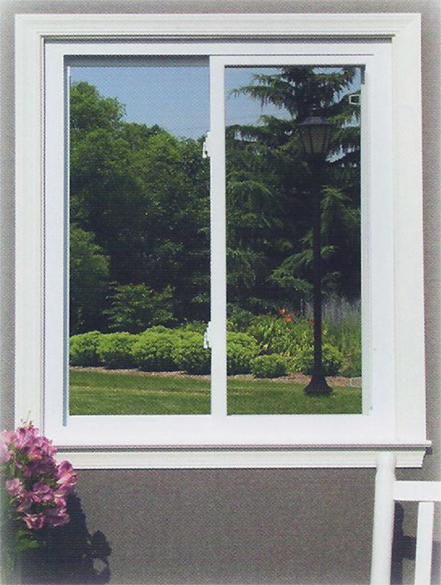 The side trapezoid casement windows open for fresh air ventilation by the use of the conveniently located handles. The top glass is designed with a slope for excellent water run-off. 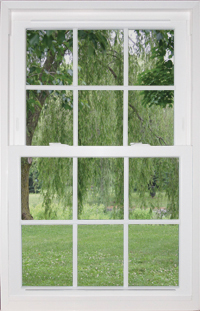 The Garden Window offers your choice of a standard 1-1/4″ oak or optional birch head, seat and jamb which you can stain or paint to match the decor of your home. White DuPont Corian™ or white laminate seat board coverings are also available to protect against spills or stains. An optional beveled and polished-edge safety tempered glass shelf or a vinyl coated wire shelf, provide plenty of room for plants or displays. Basement hopper windows are custom crafted, fusion-welded and available in custom sizes and with custom grille patterns. 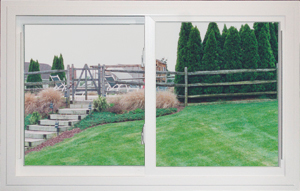 At B.F. Rich we build every basement hopper window to your specifications. 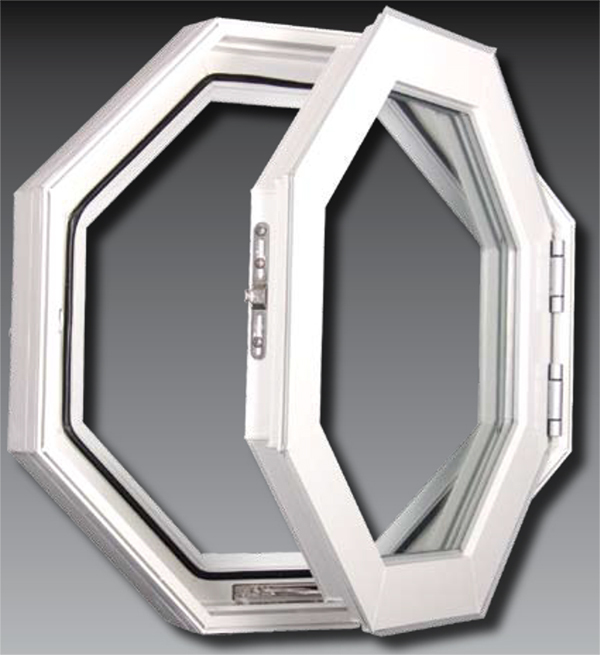 Master Frame Measures 2 1/2"
The operating octagon window is available with hard coat Low-E and argon, soft coat Low-E and argon or B.F. Rich’s Green Shield option package for optimal energy efficiency. B.F. Rich windows – for your home, your office and our planet. Size: 23 1/2" x 23 1/2"